The Russian shipbuilding industry has introduced a new project: the high-speed hydrofoil Comet-120M. These ships could revive passenger and freight service between major Russian cities and the regions. For the first time in 20 years, the Russian shipbuilding industry has introduced a new project: the high-speed hydrofoil ship, Comet-120M. This was announced last month at the International Maritime Defense Show held in St. Petersburg. The arrival of these ships could revive passenger and freight service between major Russian cities and the regions, which practically ceased after the collapse of the Soviet Union. Many Russian cities on the Volga River are not bound by regular passenger river routes, and some locales—Kaliningrad Region, Kamchatka and Sakhalin—are practically or physically cut off from mainland Russia. A decrease in transportation has led to the degradation of the economy of these regions. The development of a high-speed transportation system would not only bring these regions closer to the mainland, but also significantly contribute to their economic development. The only problem is that, until recently, the construction of hydrofoils was prohibited in the country. Not so long ago, Russia was considered a leader in the design and construction of high-speed boats and ships. 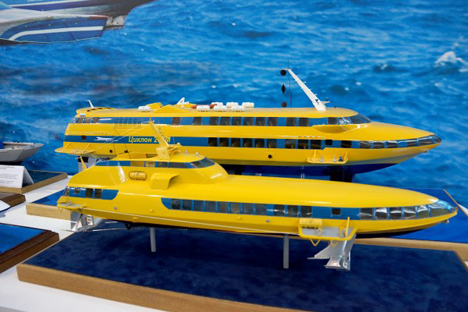 In Nizhny Novgorod, there is a construction bureau for hydrofoil vessels. At one time, the bureau was designing and building a large series of well-known river vessels in Russia and abroad. In the Soviet Union, the first high-speed passenger hydrofoil was the Rocket project commissioned in 1957—five years after hydrofoil pioneers in Switzerland, and five years ahead of United States hydrofoil projects. Next came Meteor in 1959 (capacity of up to 128 passengers), Comet in 1961 (capacity of up to 118 passengers) and Voskhod-2 in 1979 (capacity of up to 71 passengers). The so-called Alekseevsky ships are known worldwide. They were bought for the U.S., the U.K., Italy, Greece and the Middle East. Of course, in parallel with the civil vessels, military ships and hydrofoils were also built. One of the last civil projects involving hydrofoil river vessels commercially under construction in the Soviet Union was Polesie. These vessels were made between 1984 and 1996. The last hydrofoils that were built on the territory of Russia were for fulfillment of Chinese orders in 2000 and 2005, and they went along the Yangtze River. On the domestic Russian market of high-speed vessels, ships built at the turn of the last century are still operating. The current head of the Nizhny Novgorod bureau for hydrofoil, Sergei Platonov, said that the new Comet-120M is designed to carry 120 passengers; it was also designed in two models, for use in fresh water and salt water, with different corrosion protection and wings size. The vessel’s top speed is up to 60 knots (about 70 miles per hour). The control room of the Comet-120M is similar to the cockpit of a modern airliner. The new project widely uses wireless communication connection and management, and passenger comfort is better than on passenger airplanes. According to developers, the vessel is very economical. The payback period is five years, and the life of the vessel is at least 25 years. Andrew Tretelnikov, an analyst at Rye, Man & Gor Securities, notes that the market segment of the hydrofoil in Russia today is limited to hiking trails, primarily in St. Petersburg and Sochi. On the international market, Ukraine is even competition for the Russian producers of the Comet vessel, as well as the Japanese company Kawasaki, which currently delivers such vessels to the Asian market. The expert is skeptical about the idea that the market is "moving along the waves." “It is necessary to understand that these ships are made for speed: When compared with other vessels, they are less economical to operate. This load is reflected in the price of the ticket,” Tretelnikov said.